2013 Scion FR-S Pros and Cons: Why (Not) This Car? Cars have been getting larger, heavier, and more powerful. Driving enthusiasts into agile handling rather than brute acceleration have had fewer and fewer options. Sensing an opportunity, Subaru and Toyota jointly developed an all-new, rear-wheel-drive, (relatively) light sports car. In North America Toyota is marketing this sports car as the Scion FR-S.
A lot going on, to too little purpose. 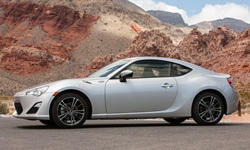 Why the 2013 Scion FR-S? The FR-S's development team made handling its top priority, and largely achieved its goals. The 2,800-pound car is great fun along a twisty road, attacking curves with excellent composure, minimal lean, and virtually no understeer until the front tires' limits are near. Some owners have complained that the all-season tires lack grip, but they proved up to the trickiest roads of West Virginia. As did the firm, tight seat bolsters. Dip into the throttle to rotate the rear end through the turn. Dip too deeply and the rear end will kick out, though more controllably than in a Nissan 370Z. The FR-S doesn't have the nimble, subtly nuanced character of a Mazda Miata or even an RX-8. Instead, it effectively translates the firmer, more brutal personality of the 370Z into a more compact, better-behaved package. Rear-wheel-drive cars can be tricky to drive. The FR-S chassis could be the most forgiving of the bunch, beating even the Mazda RX-8 in this regard. Hitting the brakes at corner entry, generally a no-no, doesn't unsettle this chassis. The brake pedal feels satisfyingly firm, and the brakes themselves proved easy to modulate and up to the challenge of hard driving along mountain roads. The stability control has three settings: normal, sport, and off. The second is well-tuned for aggressive driving, making it unnecessary to choose between an overly intrusive standard setting and doing without a safety net entirely. For someone who has never owned a rear-wheel-drive sports car, the FR-S is a very good place to start. The car's best angle. Muscular rear haunches. Analog speedometer is useless. Luckily there's also a digital one. The Scion's EPA ratings of 22 mpg city, 30 highway are easily beaten in the real world. In steady highway cruising the FR-S can top 35 mpg. Push the car hard along a curvy road, and it still manages about 25. This said, premium fuel is required. No other current car directly competes with the Scion FR-S. Well, aside from the Subaru BRZ. If you want features like nav and leather, get the Subaru. If you don't, get the Scion. The FR-S's list price of $24,955 is just a couple hundred less than that of a Hyundai Genesis Coupe, but the equivalent Hyundai is actually the R-Spec, which costs another $2,250. These are very different cars regardless, with the Gen Coupe much larger, heavier, more powerful, and more luxurious. A Ford Focus ST or Volkswagen GTI costs about the same as an FR-S, while being better equipped, but these are also much different animals.If you want the inherently balanced yet also more dynamic handling of a rear-wheel-drive sports car, even an excellent front-wheel-drive hatchback won't do. As might be expected from a joint Toyota-Subaru product, the FR-S isn't exactly pretty. Both ends are overstyled, with details that don't work. But the whole effectively expresses the car's character. It's a rear-wheel-drive sports car, and a more masculine one than a Miata. Why Not the 2013 Scion FR-S? On the back roads of West Virginia and Ohio, the FR-S's suspension tuning feels close to perfect, it's tight, precise control of body motions inspiring confidence. But in daily driving in the Detroit suburbs the same suspension feels overly firm, even harsh, with frequent jostles and kicks. On all but the smoothest highways the ride also gets irritatingly busy. If the highway has a concrete surface, road noise adds to the discomfort. Also, the same amplified, throaty engine noise that adds to the thrill of driving the car on a curvy road can seem overly loud in casual driving. Odd lines around the badge, headlights don't fit. Not suitable for frequent use. 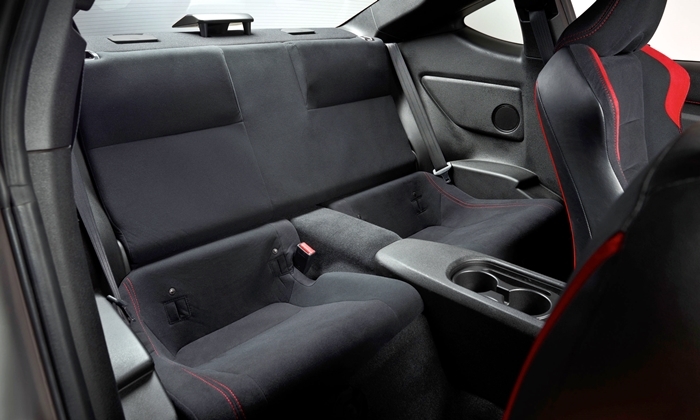 Unlike a Mazda Miata or Nissan 370Z, the FR-S has a rear seat. But even a driver of middling height will position the front seat just inches away from the rear seat, leaving too little room for a rear passenger's legs. It would help if there was enough space beneath the front seats for the rear passengers' feet, but there isn't. To even carry children in the back, occupants of the front seats must slide forward. The back seat will serve in a pinch, but the FR-S isn't viable for frequent use by four people. The late, lamented Mazda RX-8 was capable of carrying four adults thanks more intelligent packaging. The FR-S's interior styling is a mess, with many odd details and nothing approaching a cohesive whole. Materials that might otherwise seem good enough instead seem borderline cheap. Overdesign also affects the instruments and audio system. The former include a useless analog speedometer (you'll instead rely on the digital unit within the tach) while the latter's operation is the opposite of intuitive. Personally, I found the Scion's peaky 200-horsepower flat-four-cylinder engine sufficient, and noticeably stronger than the four in a Miata. You must rev it over (even well over) 4,000 rpm for thrills, but given the engine's throaty sound at high rpm and the shifter's short, firm throws I was happy to do this. Around town at lower rpm it feels peppy, with the familiar gargle of Subaru's flat fours. 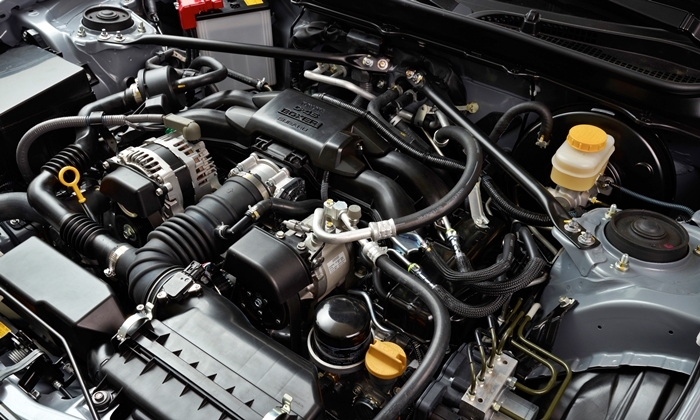 But those seeking brute thrust will be much happier elsewhere until Subaru (but not Scion) offers a 280-horsepower turbocharged engine in the car. Like any true sports car, the Scion FR-S is not for everyone. Even compared to other driver-oriented cars it's noisy, rough-riding, and impractical. But it's also an inexpensive, economical, and safe way to get the sort of handling only a lightweight rear-wheel-drive sports car can provide. Larger, heavier cars might be more comfortable, but they aren't as responsive or as engaging. Know your priorities, your tolerances, and the roads you drive, and decide accordingly. Flat four buried somewhere under its intake manifold. Not large, but more viable than the rear seat. One-week long-distance loan. Scion provided an insured car with a tank of gas. Some photos by Warren Karesh. 2013 Scion FR-S pros and cons, according to Michael Karesh: the best reasons for buying (or not buying) the 2013 Scion FR-S. Join TrueDelta to post your own impressions.